Miriam was glad to be warm and cozy. There were so many people in the town but it was nice and peaceful inside her cowshed. Little did she know that she would soon be joined by Midnight Visitors . . . and not just any old visitors! Snuggle up and enjoy the warm, soft feel the art and narrative bring to this delightful Christmas picture book with a difference. 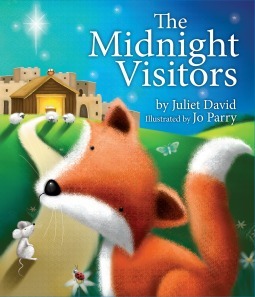 I absolutely loved this sweet book about Miriam and how she shared her space, not only with other animals on a cold night, but the baby Jesus himself. The story is perfect for children and I can't say enough good about the illustrations. This is a book that would be treasured by any child. My only regret is that my children aren't young enough to cuddle up and read with. Luckily for us though, they have a baby brother who can enjoy it for years to come. I received a copy of this book for the purpose of this review. All thoughts, comments, opinions, and smiles are my own.